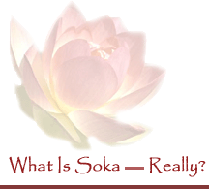 What Is Soka -- Really? Nichiren Shoshu Hokkeko members often post outrageous lies about SGI President Daisaku Ikeda. They are rephrasings of the “Gekkan Pen” articles published in Japan thirty years ago. What Is the “Gekkan Pen” Incident? The original stories were written in Japanese by Mr. Taizo Kumabe, Chief of Editorial Division of a monthly tabloid called Gekkan Pen. They were published in the March, April, and June issues of Gekkan Pen in 1976. Since they are all lies, Soka Gakkai took legal action. The police investigation revealed that Kumabe wrote these fabricated stories without any confirmation of evidence, and he was arrested in May 21, 1976, and was indicted by the Tokyo District Court on June 11, 1976. Since there was no proof for any of these stories, Kumabe was found guilty on June 29, 1978. Kumabe appealed to Tokyo High Court, but the High Court rejected his appeal on December 12, 1979. In special serial articles on Soka Gakkai published in March, April and June issues of Gekkan Pen in 1976, there was a lack of confirmation of the evidence and misunderstanding in my part. Our magazine publishes time to time righteous critical articles as a duty given to the mass-media and for the protection of public interest. However, these articles (on Soka Gakkai) crossed the line (as a fair journalistic article). For this, I express honestly the feeling of regret. The Soka Gakkai side trusted this expression of regret, withdrew the indictment, and Kumabe received probation for one year. These articles are by well-known anti-Gakkai tabloid writers who have made their living by publishing lies and fabrication in tabloid magazines for the past three decades. Although the name of Masatomo Yamazaki does not appear here, he is the person who orchestrated all these anti-Gakkai articles. The Japanese majority party LDP (Liberal Democratic Party) is a conservative, right-wing oriented party that has been dominating Japan for the past five decades. Since the party does not like any situation where normal people become strong and unite against authority, it has been manipulating Japanese mass-media to attack Soka Gakkai (which is the symbol of people’s power). Naturally, the scheme of “LDP — Anti-Gakkai writers — Tabloids” was formed and Yamazaki, Naito, Mizoguchi, Fujiwara (and more recently Okkotsu) constantly attacked Soka Gakkai and received payment. All these books (which temple members often quote) are products of these anti-Gakkai campaigns, and they are complete fabrications. The purpose of these books is to create a negative image of President Ikeda and to create doubt and fear about Soka Gakkai. They were written as nastily as possible and as sensationally as possible. In the 1995-1996 political campaign, LDP printed several million anti-Gakkai pamphlets written by Naito and distributed them throughout Japan. Nikken Sect priests and Hokkeko members participated in this pamphlet distribution campaign. As a result, LDP won the election and paid $5 million to Yamazaki. Yamazaki put the whole amount in his pocket and did not give even a penny to Naito who actually wrote the pamphlet. Naito complained about this and sent out faxes of protest to all parties involved. Yamazaki and Naito are still arguing with each other. In 1998, the situation drastically changed. Because of mismanagement by Prime Minister Ryutaro Hashimoto, Japan’s economy seriously suffered and the yen lost value. LDP lost support, and it had to ask for help from Soka Gakkai in order to survive. Prime Minister Hashimoto and Secretary General Kato both called Soka Gakkai and apologized for using these lies and fabricated stories published by anti-Gakkai writers. LDP even published an official apology in the party’s official publications. All these anti-Gakkai articles which were published in Japan during the past three decades were politically manipulated by this LDP scheme. Of course, the Temple members know this, but they still post these fabricated stories about Soka Gakkai and President Ikeda. This website is owned and maintained by Kathy Ruby. No one else is responsible for its content. Any resemblance to any other website is purely accidental and/or satirical. Any abusive email will be read and chuckled over. Any articles documenting my personal experience are just that -- my personal experience. Your mileage may vary. Isn't that so true in life? Pages are subject to change at any time based on my whim.